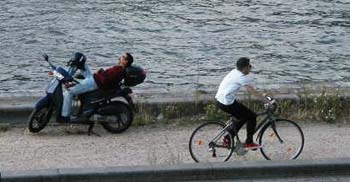 Cycling on the Seine. The Tour de France is taking a break today, but will resume tomorrow with a venegence, in the Alps. Yesterday we started out at 5pm for a three-hour walk. 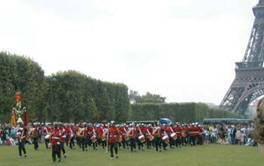 Beginning as we often do, by walking up to the Champ de Mars and on to the Seine, we were surprised to see this marching band playing on the Champ. Well, why should it surprise us? 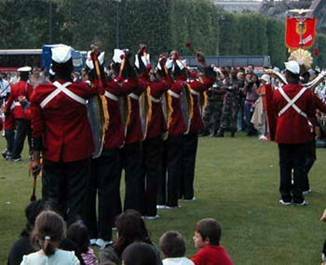 The Champ was originally conceived for marching (the name means “marching field”), it is in front of the ancient military school (l’École Militaire), and there are always many things happening in a vibrant city like Paris. All you have to do is walk out the door and open your eyes and ears. You’ll see. These men and women are career naval officers from Brazil, Tom could tell by their age, demeanor, and stripes. He was especially interested in all the drummers, of course. If you look closely at the image on the left, you will see that there are even two xylophones in the band. Officers from the nearby École Militaire were watching the band along with all of us from the public. The band’s name is something like Banda Marcial o Corpo de Fuzileiros Navais. 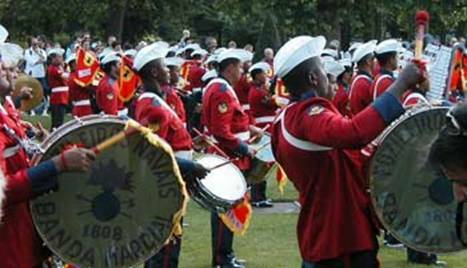 The Corps has a web site, and evidently they have a symphony band as well bossa nova band. 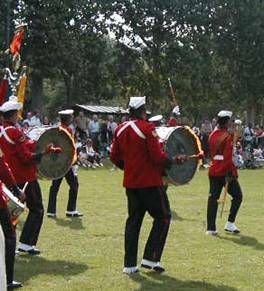 You can even download and listen to some of their marching band music at this part of their web site. The children loved the band. The band leader went to the crowd and led several children by the hand to the front of the group, where they had their photos taken. Two young Spanish-looking women engaged a nearby Brazilian soldier in conversation by asking him to take their photo. They talked, and talked, and then exchanged phone numbers. Ah Paris is for flirting. We continued on our walk up to the Seine, eastward, until we reached the very beginning of the boulevard Saint Germain. Then, for the first time, we walked the entire boulevard all the way to the very end. By then it had been three hours since we left the apartment. We went in search of dinner. Sadly, the outdoor café at the Hotel Degrés de Notre Dame was not open; it is being renovated. Pity. It would have been a perfect evening for dining outdoors. Because it was a Sunday, most of the outdoor dining places were just brasseries and pizza or couscous places. We wanted real French food, as we almost always do. So we climbed the hill toward the Pantheon and took a right turn so we landed at Le Petit Prince (corner of rue de Lanneau and rue J. de Beauvais in the 5th arrondissement). Tom’s main course was disappointing. But the rest of the food was good, and it is a real bargain. The dining room is air conditioned, but the a.c. doesn’t keep up when the room fills with people eating hot food. Forecasted ozone maximum hourly concentration : from 110 µg/m3 to 140 µg/m3. Forecasted NO2 maximum hourly concentration : from 60 µg/m3 to 90 µg/m3. Looks like we are already there. What are the health effects of bad ozone? Here is what the U.S. EPA has to say. The air quality will probably get worse as the week goes on, because there will be plenty of sunshine and warmth to cook the auto exhaust into bad ozone. This is when I start to wish that all those Parisians out there madly driving their cars around the city would just go on vacation. Just leave! The Parisian government sets lower speed limits when ozone is really bad, because cars don’t emit as many pollutants when they go slower, apparently. But these lower speed limits are widely despised and ignored. Ironically, this is the period of the year when Tom and I don’t drive cars at all. If everyone did that for three months of the year, think how much cleaner our air would be. I have several American friends who ride bikes instead of driving whenever and wherever they can. I don’t think many Americans are the worst environmental pigs. Every Western country seems to have its share. The Parisians have started to leave on vacation. The newspapers are covering the massive traffic jams caused by this mass exodus. They call it the “bison futé” (“buffalo stampede”). The traffic jams, interestingly enough, are called “bouchons” (corks used to stop wine bottles). Most things are described in food terms here, even when the subject isn’t food. Wine is food, you know. In France it is, anyway. It has essential substances necessary for life.